Caption slip reads: "Photographer: Swaim. Date: 1958-01-02. Reporter: Waymire. Assignment: Queen back to school. 11-12-15-16: Rose Queen Gertrude Wood yawns as alarm jangles to remind her the dream is over, and school keeps today. In two of the pix there is a very wilted boquet of roses. 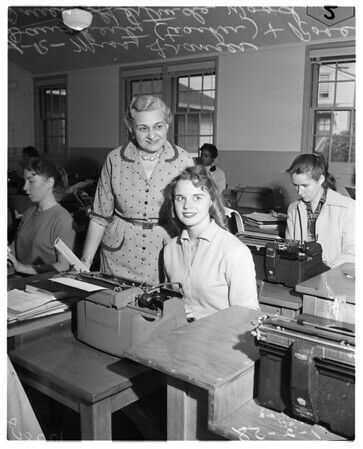 1-2: Trudy Wood in shorthand class (transcribing on typewriter) aided by teacher, Miss Frances Daughtery".